The global anhydrous aluminum chloride market is anticipated to exhibit a healthy competition amongst its market players in the next few years, says Transparency Market Research according to a recently published report. The competitive landscape of this market is substantially fragmented, wherein numerous small and medium-sized players comprise a large volume of the industry. As most of the companies are trying out new methodologies to stay alive in the competition, a high rate of development thorough market players is expected to occur in future. Most businesses are launching new products that make use of the anhydrous aluminum compound, which are used in various sectors. Few key market players are: Nippon Light Metal Co., BASF SE, Aditya Birla Chemicals, Gulbrandsen, Base Metal Group, and several others. As per the report published by TMR, the global anhydrous aluminum market’s valuation regarding market shares in 2015 was US$683.9 mn, which is further anticipated to be valued at US$912.3 mn by 2024. This growth is likely to occur at a CAGR of 3.3% during the forecast period from 2016 to 2024. Of all the segments that exist in the global anhydrous aluminum chloride market, the granules form of the material is its top leading segment. This is mainly due to various applications where the granules are used, thus being more valuable than the powdered form. This preference is expected to continue in future. Another segment of the global aluminum chloride market that holds a significant spot with respect to market shares involves the use of dyes and pigments, based on applications. Anhydrous aluminum chloride is largely used as a catalyst in the dye manufacturing industry while producing pigments. In terms of volume, about 24% of the global anhydrous aluminum chloride market was held by the dye manufacturing industry, thus making it a prime segment. On the basis of regional spread, Asia Pacific held the spot as a leading segment in 2015 for the global anhydrous aluminum chloride market. This region is also expected to hold its position for an extended time in the future. This is mainly due to the rising demand of consumer goods and pharmaceuticals in major countries such as India and China from the Asia Pacific region. One of the foremost factors that could lead towards better growth in the global anhydrous aluminum chloride market is the rise in demand of products such as dyes and pigments, which make use of this material. Most of this demand is greatly seen in the Asia Pacific region than others. The increase in demand for anhydrous aluminum chloride in consumer goods, cosmetics, and pharmaceuticals also is a key factor that is responsible for boosting growth in this market. 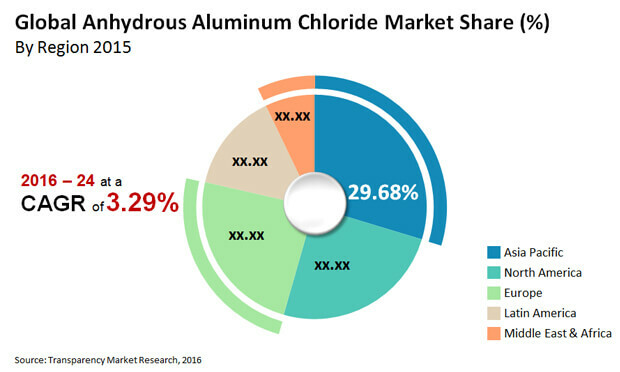 The global anhydrous aluminum chloride market may be riding high on the wave of several beneficial factors, but there are a few obstacles that are dampening the market’s effect up to a certain degree. One of the foremost hindrances is the growing apprehension of the product’ use based on several harmful emissions produced during manufacturing and their undesirable effects on the environment. The maintenance costs are quite high when it comes to taking immense effort required by manpower to put a lid on the emissions. Many governments have come up with strict rules and regulations, which might be a growing hindrance to the global anhydrous aluminum market regarding its growth rate. The material is quite toxic to human if it is accidently ingested or inhaled, and might also cause skin burns and irritation. This situation is expected to change in future as the stability in this market improves, wherein some of the regulations could become less strict. With better material handling techniques being developed, the health and environmental hazards could also be reduced.